The typical academic school day followed this pattern: At 8:30 A.M., the first bell was rung- its clear tones summoning the pupils and they soon began to arrive. At 8:55, the bell was tapped once to remind the children to take care of all those last mi nute duties before they got into their seats where they must be by the time the 9:00 bell finished ringing. Then, for about fifteen minutes, there were “Morning Exercises” which were not exercised at all, but a title for the beginning moments of the schoo l day. Sometimes, teacher read aloud from a good book, other times a quiet game was played or everyone sang. At such times, everyone began by rising to his feet, faced the flag and lustily sang the first verse of “America” or “The Star Spangled Banner.” O ther favorite songs included “Tenting on the old Campground”, “The Old Oaken Bucket”, “May Old Kentucky Home” and “Swannee.” The ingenious teacher would also plan little surprises for morning exercises. This cut down on tardiness, as no one knew when thes e surprises would come and no one wanted to miss a thing. “May I leave the room?” etc. And yes, there was regimentation. Every student knew his class schedule and was on time at the recitation bench. No one wandered aimlessly around the room or disturbed others. Preparations were completed during those five-minute periods before school began. And a teacher did have some help in knowing what to teach and what not to teach. The state put out a detailed course of study of what should be covered in each grade. The state also provided a graded book of poems and mu ch memorization of such was required. Also, every teacher of rural Seventh and Eighth Graders had to teach toward the state exams, more of which will be told later. The county commissioner of schools could be counted on to check each school at least twice a year. These visits were never announced, so the teacher had to be prepared at all times. If the teacher was having trouble or anything was reported amiss the commissioner came more often. Therefore, even though the commissioners were good people, the rural teachers dreaded extra visits. The fifteen-minute recess breaks in the morning and afternoon were barely long enough to do anything except take care of personal needs and make preparations for the next classes, but usually a rousing game of “Dare Base” or “Pom Pom Pull-away” was started with everyone, big and little joining in and everyone going in to classes rosy-checked and sweaty. When classes were dismissed for the noon hour, out came the five-pound metal syrup pails into which mothers had packed wholesome farm foods-sandwiches, boiled egg, a chicken leg, a small jar of canned fruit and a baked goodie- a cookie, a cupcake, a piece of pie or cake, etc. Good as the lunch might be, it was very often bolted down in order to get out onto the playground. The above-mentioned games might be played, but more often during this longer period, the little ones went off to their own small games and the older ones engaged in a game of baseball, “Andy-Over” or others of like nature. Occasionally, an older boy and girl could be seen holding han ds and strolling along the periphery of the playground. “Puppy love” was common for some students stayed in the rural school until they were sixteen years of age or older. The compulsory school age was from seven years of age until sixteen unless one received an eighth grade diploma before that time. As distances to school were often long, many children did not start to school until they had reached their seventh birthday. This, along with the fact that many older children were kept out of school many days to help with the work of the farm and household meant that most pupils were fifteen years old when in the eighth grade. Many of them elected not to take the state exams and stayed in school until their sixteenth birthday and some even longer as the farm work permitted. Long, teacher and pupil before those dreaded exams endured hard hours of study. The rural school year was usually eight months, so after school was out for the year, the student must continue to study and review for about a month before examination day . The exams were never held in the pupils own school. Bright and early on exam day, the horse was hitched to the buggy and the pupil went to town to the local high school. It was a frightening and traumatic experience for many, even before the questions w ere passed out. Each farm boy or girl felt so alone in this strange situation. A stern examiner was at the front of the room, where many other pupils had gathered, but for the most part were unknown to each other. Few questions were asked after exam paper s were passed out and instructions given – everyone was too scared. Seventh Graders took exams in Health, Geography, Penmanship, Orthography and Spelling. If a passing grade was received in these subjects, the student need not take that subject in the Eight Grade. Questions were hard and mostly essay type, so it took a long time to write the answers. One question in Penmanship was to write from memory one of the following: the first verse of “America” or the “Star Spangled Banner”, the preamble to the Constitution, the “American’s Creed” or the first part of the “Gettysburg Address”. No one knew which one it would be, so all of them had to be memorize d. And, not only did the handwriting count but also the spelling and punctuation. Even after one year’s experience, Eighth Graders found exam day no easier. They took exams in History, Arithmetic Grammar, Agriculture and Civics. Most adults today could no t pass those tests, nor do they need to. There were questions about the “Dred Scott Decision”, whereabouts finding the cost of wallpaper for a room, of figuring compound interest, of diagramming complex and compound sentences, about breeds of cattle and r otation of crops and how a bill becomes a law to name a few. After a student passed these exams and became the proud possessor of an Eighth Grade Diploma, high school was a snap for him, should he choose to attend. Many a rural student became valedictoria n or salutatorian of his high school graduating class. Sorry to say, the percentage of rural pupils attending high school at that time was not great. In those days, one did not need a high school education to become a farmer or farmer’s wife. The rural school was the center of the social life of the district. A “schoolmarm” was not considered “worth her salt” unless she could produce a good Christmas program. There was usually a little program for each holiday, but the Christmas program wa s the “piece de resistance”. Early in the school year, the teacher began planning and sending for Christmas books and materials. By Thanksgiving, she had decided on her program and chosen students for the roles in plays, monologues, dialogues, recitations , skits, etc. Her “Thanksgiving vacation was spent hand copying such parts. There was no typewriter available and she didn’t know how to use one anyway. Parts were handed out to her students and they were supposed to study them at home. Morning exercise period becam e a time to practice Christmas songs. About two weeks before Christmas, practice on the whole program began in earnest and lessons were all but forgotten. Makeshift costumes and props were brought from the farm homes. About a week before the program, two or three fathers raided some one’s lumber pile and came to build a stage, Mothers hustled up enough bed sheets for stage curtains. But wait – there is more to come. About three days before the program, teacher and all pupils, big and little, armed themse lves with ax and saw and went to the woods to cut a tree and gather greens for wreaths trimmings. Back at the school, the tree was set up and bits of foil, lace and cloth, scraps of colored papers, yarn and ribbon, tin can tops, walnut shells and all the things that have been saved for decorations for the tree and room. Teacher might have some tinsel ropes and artificial icicles, but all the rest was hand made including the strings of popcorn brought from home. Then, there were a couple of days of intense practice and the big day was at hand. One practice all the way through and it usually was a bad one, as the participants were tired of it and they were too excited anyway. Desks were cleaned and put in order, most everyday necessities were packed away an d school was dismissed early so everyone had plenty of time to get ready for the big event. Sleighloads of people began arriving early, each with a lantern to help light the building. Every parent greeted his neighbors and tried to find a desk in which he could be semi-comfortable. Pupils scurried around to get into costumes, find their props , etc. Finally, the big moment was at hand, the curtains were pulled and the whole school stood on the stage facing the audience to begin the performance with traditional Christmas Carols Silent Night Jingle Bells, etc. And from that time on, inspite of the poor last practice, the program usually proceeded smoothly, but if there should be a small mishap no one seemed to mind, as mothers, fathers and grandparents beamed proudly upon their favorite to be proud! Even the teacher had cause to be proud! Aft er the program, many pupils seated themselves awaited the arrival of Santa Claus. He could be one of the district farmers but it worked out get someone unknown to her pupils. Each pupil received a small gift from the teacher and a bag or box of candy and nuts sometimes from the teacher and sometimes from the school district. (This was a negotiable item at contract time.) But it was the “schoolmarm” who really received the gifts, usually a home-made item an apron, a crocheted doily, embroidered pillow cas es, a box of fudge, a fruit cake, etc. from each family in her school. And, she had to open them, admire them and sometimes model them. Each child was so very proud as she opened his family’s gift. Now, it was all over. Each family collected its brood and left but poor teacher, had to stay to bring about some semblance of order to get ready for the schoolhouse annual Christmas vacation cleaning that is, she did if she expected to go home that night with her own family, who were apt to attend her program. No wonder, that she needed a two-weeks’ vacation. Besides the Christmas and other holiday programs, teacher was expected to put on one or two all-district spelling “bees” and couple of box socials each year. These last brought in the funds for a new flag, a few library books, another picture or other things, which the district budget did not cover. The last day of school was also a gala occasion under teacher’s supervision. Near noon, families began to arrive with well-filled lunch baskets and everyone partook of a bountiful picnic dinner. Teacher was responsible for the program, which consisted mostly of games and contests for all ages. After this everyone went inside and sat down while Certificates of Promotion, awards, honors and prizes for the games were passed out. The demise of the one-room rural school came with the demise of the small farm and large farm families. School enrollments became smaller and smaller. 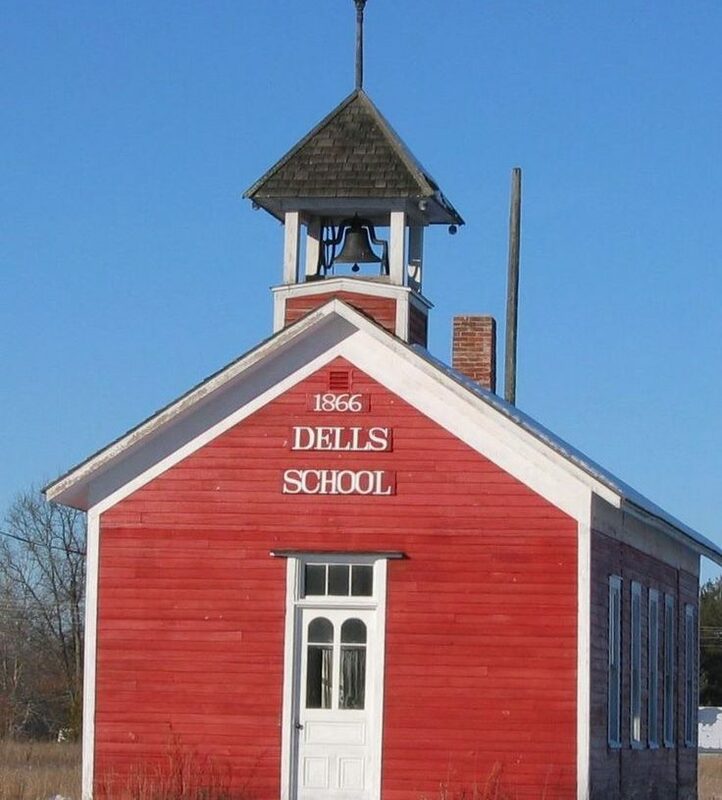 At first, the rural school did not want to give up its autonomous position, so two or th ree school districts would band together to make one school and pupils were transported in a covered wagon or “hack”. Later, there was consolidation with the graded school districts in the towns. The one-room rural school became a thing of the past, but i t had served a purpose and left a great legacy. Some very good academic learning took place within its walls. But even more important were the values implanted in those of us privileged to attend one of them – the values of love, compassion, independence, unselfishness, helpfulness, industriousness, patriotism, honor honesty integrity and many more. The one-room rural school from which the preceding remembrances were derived was Towne School, District #6 fractional (Wilcox and Monroe townships, but located in Monroe on old M-20 between White Cloud and Woodville). The writer, Velma Fowler Matson at tended this school, from the fall of 1916 until the spring of 1923. Her teachers during that period of time were Jessie Davis, Helen Gleason, Mabel Wilson, Blanche Boss and Milo Fry. Helen Gleason provided the inspiration for Velma to become a schoolteach er. In subsequent years, Velma’s brothers, Byron and Arthur and her sister, Ruby also attended this school. Her father, Clarence Fowler was on the school Board from about 1916 to 1942, when the school property was sold. Her mother, Belinda Fowler, sometime s provided room and board for the schoolteacher, although not while Velma was in school there. In those days, the population was not very mobile, so most of the farmers in the district remained for many years. Other pupils who stayed in this school through out their elementary years came from the following families: the Townes, the Halls, the Ka isers, the Richards, and the Bouchers, the Swartzs the Leenhouts and the Kersteins. Many others attended this “little red schoolhouse” from time to time, but the above families were more or less permanent. 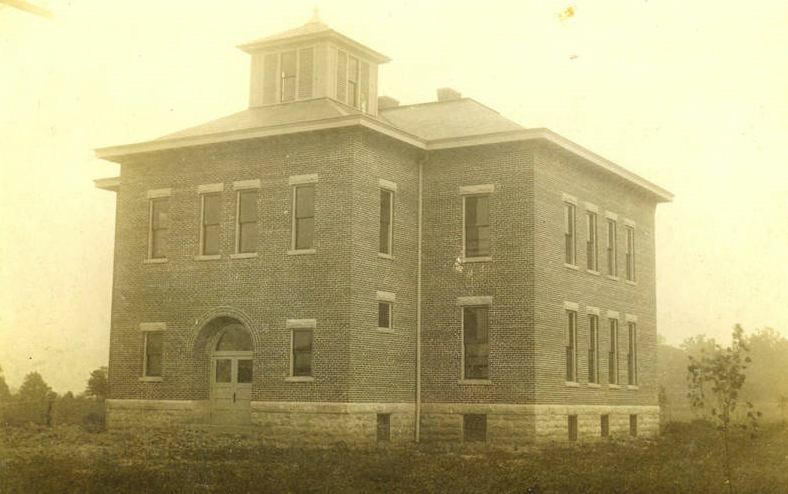 The school’s last year of operation was the 1936-1937 school year. Because of a governmental “mix-up”, the Civilian Conservation Corps was ordered to demolish the building within two or three years after its closing. The district was paid for the demol ished building and soon put the property up for sale. It sold in 1942 and thus ended the saga of one one-room rural school.